High Back Pressure Foam Makers - SOS Safety International Inc. The CHEMGUARD high back-pressure foam maker consists of a pre-assembled body, discharge tube, turbulator, and metering orifice. The foam makers are available in ten models (HBPFM) with nominal flow rates ranging from 100 gpm to 550 gpm (379 Lpm to 2082 Lpm). A screened air inlet allows uniform air distribution into the foam solution stream resulting in the generation of expanded foam. The screened design helps inhibit the entrance of foreign material. A pressure gauge, 0 psi to 300 psi (0 bar to 20.69 bar), is provided in the foam maker body to allow monitoring of the water inlet pressure. A pressure gauge shroud is integral to the cast metal body to help prevent gauge damage. CHEMGUARD High Back-Pressure Foam Makers (HBPFM) are designed to generate expanded foam for the purpose of subsurface injection into a cone-roof liquid hydrocarbon storage tank. * The foam maker is typically located outside the diked area surrounding the storage tank. Expanded foam is injected through a dedicated foam line or into a product line to the storage tank (refer to Typical Schematics). The high back-pressure foam maker is capable of generating expanded foam within the optimum expansion ratio range of 2:1 to 4:1 for subsurface injection. The foam maker can discharge against a back pressure as high as 40% of the operating inlet pressure. 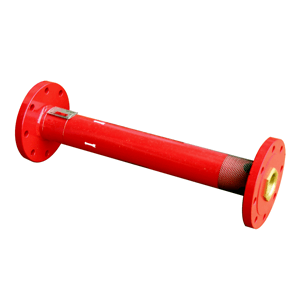 A minimum foam maker inlet pressure of 100 psi (6.9 bar) is typically required for satisfactory operation. High back-pressure foam makers can be used with various types of proportioning equipment including bladder tanks, balanced pressure pump proportioning systems, in-line balanced pressure proportioning systems, and foam trucks. Line proportioning systems are usually unacceptable due to the relatively high pressure loss across the line proportioner, except in instances where back pressure to the foam maker is low and available water pressure to the line proportioner is relatively high. * The flammable liquid being protected must be a hydrocarbon product. Polar solvent flammable liquids or hydrocarbons containing more than 10% alcohol are destructive to subsurface injected foams. See NFPA 11. The storage tank protected should be of cone-roof construction without any type of internal floater. NFPA 11 does not recommend subsurface injection systems for open top or covered floating roof tanks because of the possibility of improper distribution of foam to the fuel surface. The high back-pressure foam maker assembly shall consist of an anodized aluminum body and discharge tube. The internal foam turbulator and metering orifice shall be machined from stainless steel and sized to match the designated flow rate and corresponding model designation. 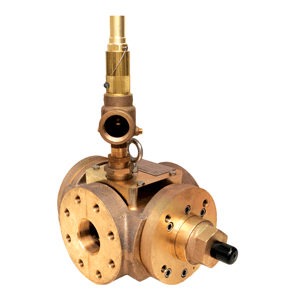 Nominal 100 gpm to 300 gpm (379 Lpm to 1136 Lpm) assemblies shall be provided with a 2 1/2 in. NPT female inlet and 2 1/2 in. NPT male outlet. 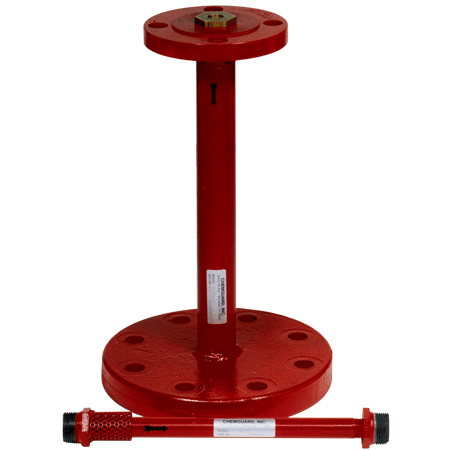 Nominal 350 gpm to 550 gpm (1324 Lpm to 2082 Lpm) assemblies shall be provided with two ANSI 150 lb flat face flanges: a 4 in. pipe flange inlet and a 6 in. 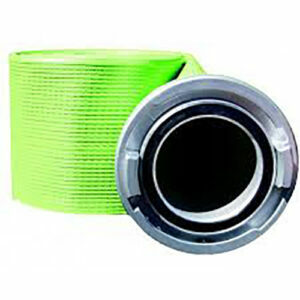 pipe flange outlet. The high back-pressure foam maker shall have a stainless steel air inlet screen, cylindrically shaped to the air inlet surface to help ensure optimum performance and avoid damage. A pressure gauge, 0 psi to 300 psi (0 bar to 20.69 bar), shall be provided in the foam maker body to monitor operating pressure. The pressure gauge shroud shall be integral to the cast metal body to help prevent gauge damage. 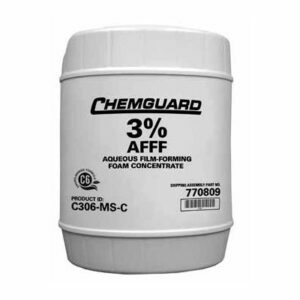 CHEMGUARD and the product names listed in this material are marks and/ or registered marks. Unauthorized use is strictly prohibited.